The historic homelessness crisis that Mayor de Blasio inherited worsened during his first year in office, due to three factors: (1) New York City’s acute housing affordability crisis; (2) the lingering impact of former Mayor Bloomberg’s disastrous homeless policies, which continued for most of the year; and (3) the failure of the State and City to act quickly enough to reverse the Bloomberg-era policies and restore permanent housing assistance for homeless families and children. But entering the New Year, there is reason for genuine hope. The de Blasio administration has enacted a vigorous plan to move thousands of homeless New Yorkers from shelters to long-term, permanent housing. And there is hope that the City will partner with the State to create more permanent supportive housing for thousands of homeless individuals and families living with special needs. Alongside other crucial reforms, these efforts will help undo the damage of Bloomberg policies, which eliminated virtually all permanent housing assistance for homeless New Yorkers and led to soaring, record-high homelessness in New York City. There is no question that both Governor Cuomo and Mayor de Blasio can and must do more. In particular, they should target federal and City housing resources to homeless New Yorkers and enhance State-City rental assistance programs. 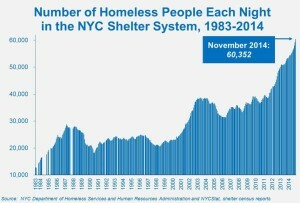 But as a result of reforms and policies introduced in 2014, there is real hope that – for the first time in nearly a decade – New York City’s homeless population will decline over the coming year. One major cause of rising homelessness in New York City during 2014 remains unchanged from recent years: The acute and worsening housing affordability crisis. By every measure, it is clear that New Yorkers have experienced a widening gap between incomes and housing costs. This widening affordability gap was most acute for poor and low-income New Yorkers, who saw their incomes fall in real terms in recent years at the same time that apartment rents continued to rise. Data on evictions provide some of the strongest evidence for the impact of the affordability crisis on New York City’s growing homeless population. Over the past decade the number of evictions in New York City rose from 22,000 per year to more than 27,000 evictions – and that data accounts only for evictions actually completed by a city marshal, not the larger number of informal evictions. At the same time both the number and percentage of families who entered the NYC homeless shelter system directly after an eviction rose even more dramatically. From 2002 through 2012, the number of homeless families annually entering shelter after an eviction tripled, from 1,000 families (17% of the total) to more than 3,000 families (32% of the total). Currently around one-third of all homeless families entering the shelter system do so immediately after an eviction. The other major cause of rising 2014 homelessness is the legacy of former Mayor Bloomberg’s destructive homeless policies, and the failure of the State and City to act quickly to reverse those flawed Bloomberg-era policies. The most disastrous policy of the Bloomberg administration was the elimination of all permanent housing assistance designed to help homeless families and children move from shelters to their own homes. This included Bloomberg’s 2005 policy denying NYCHA public housing apartments and federal housing vouchers to homeless families, and the failure to allocate City-subsidized housing to homeless New Yorkers. Bloomberg compounded that error by replacing proven federal housing programs with flawed temporary rental assistance programs, which he then eliminated entirely nearly five years ago. Upon taking office, Mayor de Blasio pledged to reverse these failed policies in order to address the homelessness crisis he inherited from Bloomberg. Mayor de Blasio also reversed the Bloomberg-era policy denying NYCHA public housing apartments to homeless families. In June, the City announced it would resume priority referrals of homeless families to available NYCHA apartments. However, instead of the 2,500 public housing apartments that advocates and many elected officials urged the City to allocate to homeless families, the de Blasio administration allocated only 750 apartments, barely 12% of NYCHA vacancies each year. And the City exhausted that allocation by early autumn. As a result of the delays in the new City-State rental assistance programs and the inadequate allocation of NYCHA resources, throughout 2014 the City has only moved around 1,000 homeless families from shelters to permanent housing, with nearly all of those placements occurring after August. This more than anything explains the consistent rise in the number of homeless families during the year. The legacy of the failed Bloomberg-era policies, combined with delays in reversing those policies, meant that homeless families remained in shelters with little-to-no access to housing assistance designed to help them obtain housing. The good news, though, is that homeless plan enacted by the de Blasio administration in the last quarter of 2014 will lead to reductions in family homelessness in the coming year. New York City’s homeless shelter population is up nearly 12% from last year and reached 60,000 people per night towards the end of 2014. There is therefore little question that much work needs to be done to confront record-high homelessness. Mayor de Blasio’s current plan is a major step forward in at last addressing this historic crisis. But more can and must be done. The de Blasio administration’s plan aims to help more than 5,200 homeless families move from shelters to permanent housing by the autumn of 2015. The plan includes 4,000 families helped by the new LINC rental assistance programs, which provide up to five years of rent subsidy and are targeted to homeless survivors of domestic violence, working homeless families, and families with multiple episodes of homelessness. Another 1,250 homeless families will be helped by a combination of NYCHA public housing apartments and other federal housing programs. All in all, the City’s plan will stem the increase in family homelessness seen in recent years and, by the second half of 2015, likely lead to actual reductions in the number of homeless families and children in New York City shelters – the first such reductions in nearly a decade. Moreover, in December the de Blasio administration expanded the LINC programs to assist an additional 2,100 homeless single adults, including seniors and working shelter residents. And there are hopeful signs that the City a State will partner to create more permanent supportive housing for homeless New Yorkers living with disabilities. Expanding shelter for homeless and runaway youth and removing children from dangerous City-run shelters. All in all, while more can be done to target permanent housing resources to homeless children and adults, Mayor de Blasio has laid the groundwork for long-overdue reductions in New York City homelessness over the coming year.